Castruccio is an old Italian lord, and his name is a pun on the word castrated. This pun is furthered by the fact that Castruccio’s wife, Julia, is having an affair with the Cardinal. A soldier and courtier in Ferdinand’s court. Of all the courtiers, he alone seems to have some sense of honor and independence of mind. A Roman courtier, friend of Ferdinand. The Duchess’s waiting-maid. She is loyal to the Duchess throughout, and dies for it. A courtier at Amalfi attending the Duchess. A Doctor to Ferdinand who diagnoses the Duke with the disease Lycanthropia. Several insane people sent by Ferdinand to torment the Duchess, though she actually finds that they distract her from the torture of her thoughts that plague her when there is silence. The executioners work for Ferdinand and carry out the murders of the Duchess, her children, and Cariola. Witnesses to the banishment of the Duchess and Antonio. Throughout the play there are several servants, some of whom are killed. Though they are not named and do not speak, the Duchess’s three children appear on stage a number of times. The two younger children wind up murdered, but the oldest survives and under Delio’s care seems likely to inherit his mother’s wealth and lands. Ginsburg, Jacob. "The Duchess of Malfi Characters." LitCharts. LitCharts LLC, 19 Apr 2017. Web. 21 Apr 2019. Ginsburg, Jacob. "The Duchess of Malfi Characters." LitCharts LLC, April 19, 2017. 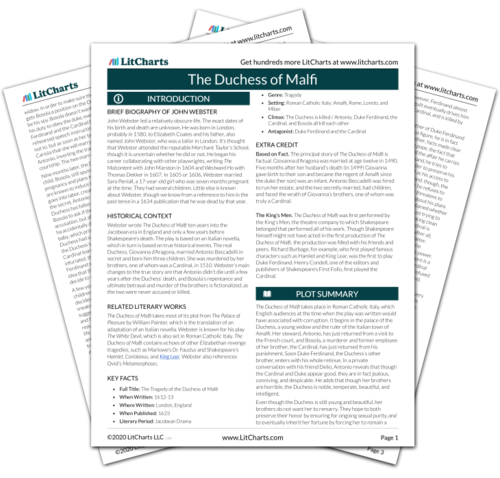 Retrieved April 21, 2019. https://www.litcharts.com/lit/the-duchess-of-malfi/characters.